Proponents of organic farming have long promoted the view that the likelihood of pest outbreaks is reduced with organic farming practices, including establishment and maintenance of "healthy" soil (Howard, 1940; Oelhaf, 1978; Merrill, 1983). Recent studies have shown that plant resistance to insect and disease pests is linked to optimal physical, chemical, and—perhaps most importantly—biological properties of soil (Altieri and Nicholls, 2003; Zehnder et al., 2007). Other researchers have reported evidence of various types of signaling between soil and plants mediated by soil organic matter (Phelan, 1995, 1996; Stone et al., 2004) that could be enhanced by management. In organic farming, enhancement of soil fertility is accomplished through rotations, cover cropping, and the application of plant and animal materials. This article addresses some of the main elements of soil management that can help to reduce insect pest problems, including soil and fertility management, use of mulches, and sanitation. Healthy, vigorous plants that grow quickly are better able to withstand pest damage. However, over-fertilizing crops can actually increase pest problems. Research has shown that increasing soluble nitrogen levels in plants can decrease their resistance to pests, resulting in higher pest density and crop damage. 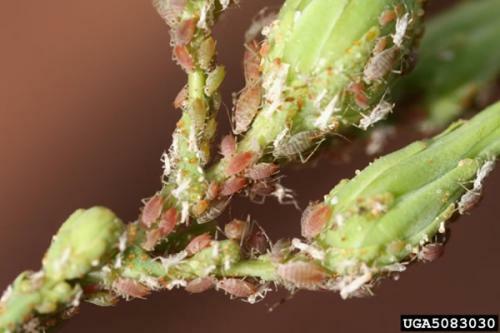 For example, increased nitrogen fertilizer rates have been associated with large increases in numbers of aphids and mites. Figure 1. An excess of available nitrogen can increase the susceptibility of some crop plants to outbreaks of aphids, mites and other arthropod pests, like these potato aphids, Macrosiphum euphorbiae (Thomas), on lettuce. Figure credit: Whitney Cranshaw, Colorado State University, Bugwood.org. Healthy soils high in organic matter and with a biologically diverse food web support plant health and nutrition better than soils low in organic matter and soil microbial diversity. In addition to supporting vigorous growth of plants better able to tolerate pest damage, healthy soils also contain many natural enemies of insect pests, including insect predators, pathogenic fungi, and insect-parasitic nematodes. How Many Different Organisms are in a Teaspoon of Soil? 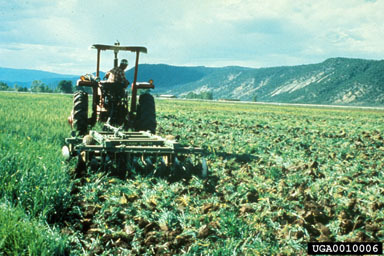 Learn more about the Soil Food Web at: http://www.nrcs.usda.gov/wps/portal/nrcs/detailfull/soils/health/biology/?cid=nrcs142p2_053868. A soil's physical condition, level of compaction, water-holding capacity, and drainage, all affect soil and plant health. The chemical aspects of soils (pH, salt content, availability of nutrients, etc.) can affect crop health and pest susceptibility. There are several strategies for improving soil health. In general, the focus should be on increasing soil organic matter to improve soil structure and to provide food for soil microbes that in turn make nutrients available to plants. Rotation with cover- and green manure crops should be the farmer’s primary strategy for increasing soil organic matter. Manure and compost can also be added to supply organic matter and to provide supplemental nutrients. Figure 2. Rotation with cover and green manure crops should be the farmer's primary strategy for increasing soil organic matter. Figure credit: Thomas D. Landis, USDA Forest Service, Bugwood.org. Tillage can be beneficial because it disrupts the life cycle of insect pests and can expose pests to predators and the elements. Fall tillage can destroy crop debris that serves as over wintering sites for flea beetles, corn borers, squash bugs, and other insect pests. However, excessive tillage can accelerate the decomposition of soil organic matter and deplete the food source that soil microorganisms depend on, decreasing their ability to disrupt pests. Excessive and untimely tillage can also contribute to soil erosion. Mulches, both organic and synthetic, can help reduce insect pest problems. Plastic mulch is often used to speed early season crop growth that makes plants better able to tolerate insect feeding. Reflective mulch repels thrips and aphids and can reduce the incidence of insect transmitted virus diseases in vegetable crops. Note that the National Organic Program (NOP) final rule (USDA, 2000) allows the use of plastic or other synthetic mulches for weed and pest control, provided they are removed from the field at the end of the growing or harvest season. As always, consult with your certifier/inspector before using a new product or input in your certified organic operation, and read the article, Can I Use This Input on My Organic Farm? Research has shown that straw mulch can suppress early season Colorado potato beetle (CPB) activity by creating a micro-environment that increases the number of predators like ground beetles, lady beetles, and lacewings. 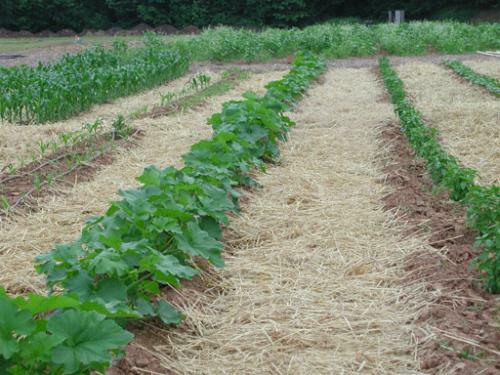 Mulching with straw can also reduce the CPB's ability to locate potato plants. In these trials, defoliation was reduced and potato yields were increased by one-third compared to plots with no mulch. Figure 3. Straw mulch between rows to suppress pests. Figure credit: Geoff Zehnder, Clemson University, Clemson University Sustainable Agriculture Program. Sanitation measures can be used to help prevent the introduction of pests onto the farm, to prevent the movement of pests within the farm, and to remove overwintering or breeding sites for pests on the farm. Start with pest-free plants; inspect plants brought onto the farm to prevent the introduction of pests. Removal or incorporation of crop residue can eliminate overwintering sites for some pests. Infested plants should be removed and composted, buried, or otherwise destroyed as soon as possible. Removal of weeds and natural vegetation bordering crops may eliminate alternate hosts for some insect pests. Bear in mind that these areas may also harbor natural enemies; therefore, the grower must carefully assess the potential threat from pest insects in these areas before mowing or removing any plants. When working in an infested area, clean equipment and clothes before going to another area of the farm. Pests such as whiteflies and spider mites can be carried on workers' clothes and spread to new areas. Altieri, M. A., and C. Nicholls. 2003. Soil fertility and insect pests: Harmonizing soil and plant health in agroecosystems. Soil Tillage Research 72: 203–211. (Available online at: http://dx.doi.org/10.1016/S0167-1987(03)00089-8) (verified 11 March 2010). Howard, A. 1940. An agricultural testament. Oxford University Press, London. Merrill, M. C. 1983. Bio-agriculture: A review of its history and philosophy. Biological Agriculture and Horticulture 1: 181–210. Oelhaf, R. C. 1978. Organic farming: Economic and ecological comparisons with conventional methods. John Wiley, New York. Phelan, P. L., J. F. Mason, and B. R. Stinner. 1995. Soil-fertility management and host preference by European corn borer, Ostrinia nubilalis (Hübner), on Zea mays L.: A comparison of organic and conventional chemical farming. Agriculture, Ecosystems and Environment 56: 1–8. (Available online at: http://dx.doi.org/10.1016/0167-8809(95)00640-0) (verified 11 March 2010). Phelan, P. L., K. H. Norris, and J. F. Mason. 1996. Soil-management history and host preference by Ostrinia nubilalis: Evidence for plant mineral balance mediating insect-plant interactions. Environmental Entomology 25: 1329–1336. Stone, A. G., S. J. Scheuerell, and H. M. Darby. 2004. Suppression of soilborne diseases in field agricultural systems: Organic matter management, cover cropping and other cultural practices. p. 131–177. In: F. Magdoff and R. Weil (ed.) Soil organic matter in sustainable agriculture. CRC Press, Boca Raton, FL. United States Department of Agriculture. 2000. National organic program: Final rule. Codified at 7 C.F.R., part 205. (Available online at: http://www.ecfr.gov/cgi-bin/text-idx?SID=a6a0935ddf00e166695f4c2138bd58d8&mc=true&node=pt7.3.205&rgn=div5) (verified 11 March 2010). Zehnder, G., G. M. Gurr, S. Kühne, M. R. Wade, S. D. Wratten, and E. Wyss. 2007. Arthropod management in organic crops. Annual Review of Entomology 52: 57–80. Culliney, T. W., and D. Pimentel. 1986. Ecological effects of organic agricultural practices on insect populations. Agriculture, Ecosystems and Environment 15: 253–266. (Available online at: http://dx.doi.org/10.1016/0167-8809(86)90124-6) (verified 11 March 2010). Eigenbrode, S. D., and D. Pimentel. 1988. Effects of manure and chemical fertilizers on insect pest populations on collards. Agriculture, Ecosystems and Environment 20: 109–125. (Available online at: http://dx.doi.org/10.1016/0167-8809(88)90151-X) (verified 11 March 2010). Blumberg, A.J.Y., P. F. Hendrix, and D. A. Crossley. 1997. Effects of nitrogen source on arthropod biomass in no-tillage and conventional tillage grain sorghum agroecosystems. Environmental Entomology 26: 31–37. Arancon, N. Q., P. A. Galvis, and C. A. Edwards. 2004. Suppression of insect pest populations and damage to plants by vermicomposts. Bioresource Technology 96: 1137–1142. (Available online at: http://dx.doi.org/10.1016/j.biortech.2004.10.004) (verified 11 March 2010). Phelan, P. L. 2004. Connecting belowground and aboveground food webs: The role of organic matter in biological buffering. Chapter 5. p. 199–226. In F. Magdoff and R. R. Weil (ed.) Soil organic matter in sustainable agriculture. CRC Press, Boca Raton, FL. Altieri, M. A., C. I. Nicholls, and M. A. Fritz. 2005. Manage insects on your farm: A guide to ecological strategies. Sustainable Agriculture Network Handbook Series Book 7. National Agricultural Laboratory, Beltsville, MD. (Available online at: http://www.sare.org/Learning-Center/Books/Manage-Insects-on-Your-Farm) (verified 25 April 2011).